Documents submitted by the defense ministry show the earlier reported proposal from the defense intelligence agency to declare martial law may have been more deliberate than earlier believed, the presidential office Cheong Wa Dae said Friday, apparently implying the military may have actually sought to go ahead with such a plan. 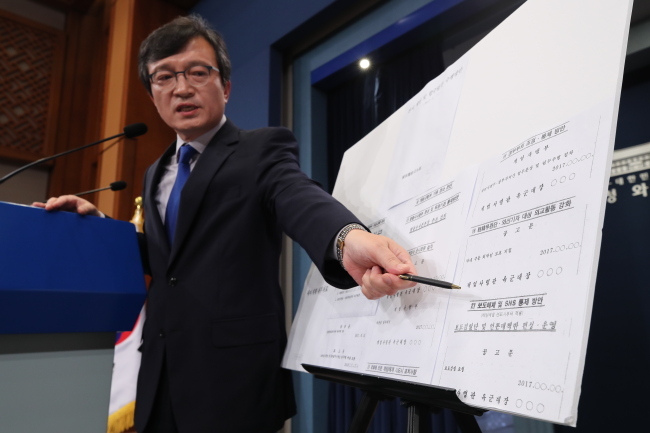 Cheong Wa Dae spokesman Kim Eui-kyeom said the military maintained and renewed its plans for a martial law every two years, but that the new documents submitted by the ministry showed significant changes and differences from the original plans. "Usually, the military renews its martial law plans every two years," the spokesman told a press briefing. "(Cheong Wa Dae) has confirmed the submitted documents are completely different from the existing plans." 2016 that led to the ouster of former President Park Geun-hye on suspicions of corruption. Kim said the proposal even included plans to inspect and censor news articles. Also, the DSC suggested the chief of the Army take control of a martial law command, instead of the chairman of the Joint Chiefs of Staff under conventional military plans. It also suggested the head of the National Intelligence Service be subject to leadership of the top military commander under its proposed martial law, suggesting military control of the government, as well as the top spy agency. To the apparent surprise of many, the DSC even stressed a need to arrest and remove then opposition lawmakers who took part in the protest rallies against Park, partly to prevent the parliament from impeaching then-President Park and lifting the martial law, Kim explained. The now ruling Democratic Party was then the main opposition and single largest party in the unicameral parliament. Park was impeached by the opposition-led parliament in late 2016. She was removed from office in March 2017 by a Constitutional Court decision that upheld the parliamentary impeachment. A special investigation team has been formed at a direct order from President Moon to investigate the controversial martial law proposal from the DSC. The Cheong Wa Dae spokesman said the investigation team too has secured the military documents submitted to the presidential office.